Save the Manatee Club is recognized as the world’s leading manatee conservation organization. It has been the voice for manatees since 1981, when it was established by singer/songwriter Jimmy Buffett and former Florida governor and U.S. Senator Bob Graham to protect manatees and their aquatic habitat for future generations. Include Save the Manatee Club in your will or trust. Gift Save the Manatee Club now and receive lifetime income and tax benefits from a gift annuity or charitable remainder trust. Name Save the Manatee Club a beneficiary of a life insurance policy or the remainder of a retirement plan after your lifetime. Donate real estate now and receive tax benefits. Ask your employer if they have a Matching Gifts Program. Many employers will match your contribution, or even double your gift. If you are a federal employee, designate Save the Manatee Club to receive your payroll deduction contributions. The Club is a member of the Wild Animals Worldwide Federation, part of Independent Charities of America. Our Combined Federal Campaign (CFC) registration number is 20422. If you participate in a local or state workplace giving campaign, you can also designate Save the Manatee Club to receive your contributions. Adopt-A-Manatee®. Please click here for more information. Purchase Save the Manatee Club’s manatee-related gift merchandise. 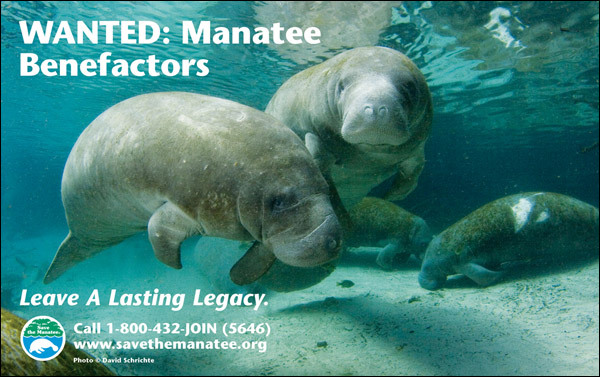 Please consult your attorney or financial planner about including Save the Manatee Club in your estate planning and other planned giving options. Save the Manatee Club, Inc., a not-for-profit 501c3 organization organized under the laws of Florida and having its offices at 500 N. Maitland Avenue, Maitland, Florida 32751. Federal Tax Identification Number: 59-3131709. If you have already included Save the Manatee Club in your plans, please take a moment to let us know so that we can recognize your thoughtfulness and kindness.